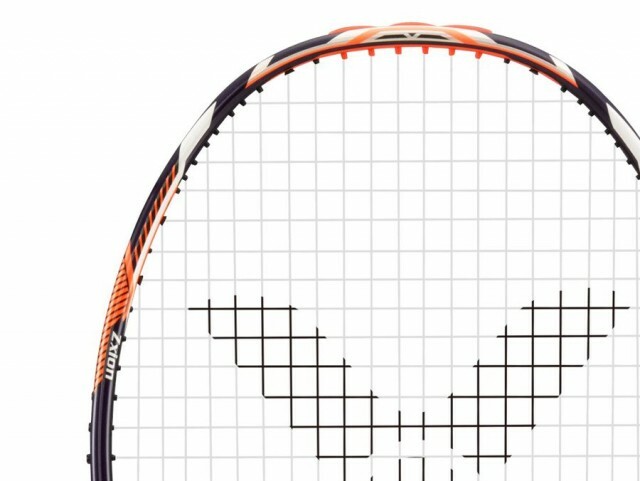 Thruster K 9900 Neon Orange is the new flagship racket from Victor in their head heavy range. In Europe TK9900 is featured in the new Victor 2017-18 catalogue. This racket has a bit of a dark past. The original TK9900 was launched two years ago and quickly recalled from the market. A mark II version followed later although Europe only received a handful. This latest version, the mark III (Neon Orange) has now arrived and features a bright orange bumper strip at the top of the head and a glossy finish which distinguishes it from previous versions. The big question now is whether Victor have finally got it right or is this racket doomed? Thruster K 9900 arrived with the standard full length racket cover, which is so much better than those flimsy cloth bags. This is a good-looking badminton racket in what I describe as dark purple and orange, a very striking combination, with the new gloss finish. This is a 3U version (85-89g) G5, small grip. The racket arrived with a set of Ashaway Zymax Fire 66 Power in orange. I restrung to 25lbs tension. Boy, it looks great with this string! I had the pleasure to test both mark I and mark II versions of this racket and in both weights. I found the earlier versions very difficult to play with. I’m hoping this version is much better although have my worries that the 3U version may be a touch too heavy to appeal to many players. Specs for TK9900 are a small compact head, similar to Jetspeed 10, which is also fairly weighty with super-slim medium/stiff. Overall, this is a combination I know very well so I have high hopes that Victor has finally got it right. After a few clears it is evident this is a completely different feel compared to previous versions. We now have a powerful and yet incredibly friendly racket that flows beautifully and hits so nice. Whilst I’m not a huge fan of the compact head as it has that “tight” feeling on impact, TK9900 plays so nice and I could easily be converted. This is like playing with an old friend. Drop shots were really quick and controlled. There is a great, solid feeling on impact with the shuttle without an noticeable lag in the head from the weight. It’s nice to be able to open up with this racket without feeling restricted at all by a weighty beast that can only be wielded for short periods of time. I felt as though I could hit all day with Thruster K 9900, and that’s a huge compliment for this type of frame. Onto the smash. Yes, this racket is powerful and my testing partner rifled a number past me with so much ferocity and accuracy. Whilst I don’t hit as hard, I still unleashed a number of big guns which kept me satisfied for the week. Even one or two off-centre shots stayed on course which really pleased me. Flat drives and pushes were a lot more comfortable compared to other head heavy rackets with similar specs that I have tried. Again, I felt as though I could keep going rather than tire quickly due to the weight in the head. It’s another box ticked on this racket. Whilst this is not the fastest frame from Victor, I was still able to depend a very high percentage of shots. Blocks were really solid, drives flew nicely too. I had to work my hands hard on lifts but was rewarded with a lot of long, deep shots without too much effort. This racket is surprisingly manouverable. Those fast net interceptions were fun and needed very little backswing to get a solid, clean shot to the floor. 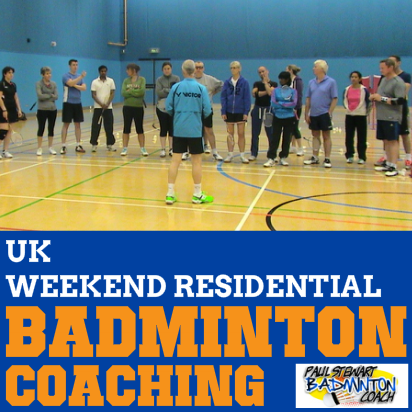 Serve and return of serve were good with enough manoeuvrability to catch a number of players through changes in direction. Even those tight net kills felt good rather than forced. I had reservations about the Victor Thruster K 9900 having played with two previous versions that just didn’t feel good. However TK9900 mark III is completely the opposite. These specs are very familiar and I can honestly say this racket is definitely up there with the best. It’s a lot more user-friendly compared to Z Force II. I’ll take this one step further and say that is the best Thruster from Victor that I have had the pleasure to play with. It’s definitely staying in my bag! What makes this work so well is that Victor have combined the right head weight with the right stiffness in the shaft. It’s a winning combination for sure. In the limited time I have used this racket, every player who has borrowed it and tested it has wanted one. That says a lot. RRP is a hefty £190. Online retails have discounted down to around £145. It’s at the top end of the price spectrum and every bit as good as any other top-end racket with this specification. Unexpectedly the 3U version was highly manoeuvrable with plenty of beef too. I had a lot of fun with this racket and it’s going to be great to hit with it again. So, for me I am happy to provide a rating of five stars and a silver award. Hey, I recently broke the frame on my voltric and am in the market for a new racket. I was wondering what differences you’ve perhaps noticed between this and the ashaway viper xt1600? Can’t find many reviews/literature on the ashaway apart from the review that you had previously written. Hi Paul, Thanks for this review, I am a fan of your reviews and find them very useful. I have a dilemma. 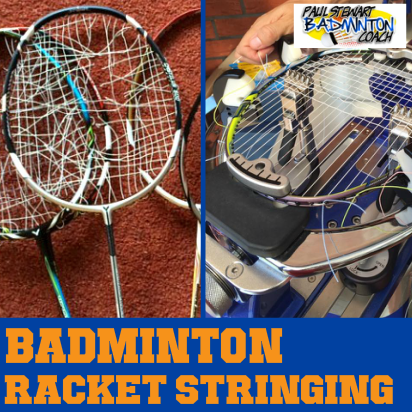 My Rackets: I used to use the Voltric 70, then moved to the Thruster 9000 (following your review) which I loved the feel of. However, I broke 2 of these in quick succession during normal, sweet spot hits so decided to go back to Yonex from Victor. I then started using Voltric Lin Dan Force (stealth Black colour) and loved it. I could get more power with this than the Thruster 9000. 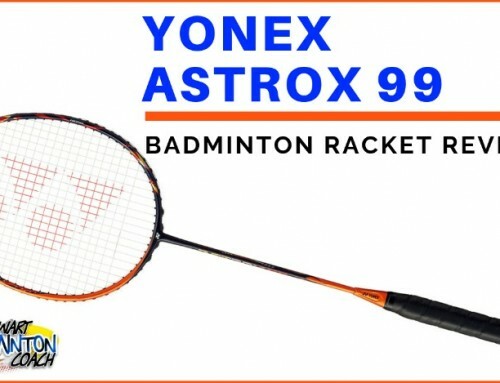 However, now Yonex have discontinued it!!! So I need a head heavy racket that is similar to the Voltric Lin Dan Force. My options are: Voltric Z Force II. 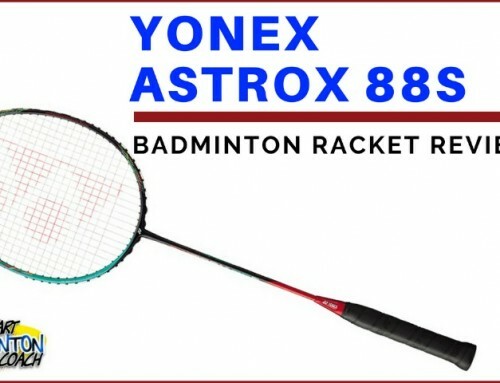 Thruster 9900 or also: The new Thruster F. Have you seen this racket of reviewed it yet? (new flagship Thruster). I am slighting leaning towards the Thruster 9900. I am worried the Thruster F is going to be ‘extreme’ head heavy (a bit like the Voltric Z Force II) so harder to master. Can you help. What do you think? Sorry to hear your original 9000’s broke. Did you return them to the retailer? I agree Lin Dan Force was a great racket and I can’t understand why it has been removed from the range, apart from the fact that Yonex are scaling down the Voltric series and replacing with Astrox. I had a hit with Astrox 88 S today and found it very difficult, which was a surprise. Within the next week or so I will be completing my written review of TKF. I will say it’s a superb racket and I can’t put it down! It is quicker than TK9000 but packs bags of punch. It is going to be very popular. A few players borrowed mine and they all bought one, which says a lot. TK9900 will soon be withdrawn from the range and won’t be offered in Europe this year. Likewise, it won’t be long before Voltric Z Force 2 is removed although I consider it will take longer to withdraw that racket. The new Li-Ning N90 mark IV looks promising too but I haven’t had the opportunity to try it yet. I can’t see it beating TKF though. My preference doesn’t really matter because I do not play with these rackets. That said, I believe TK9900 is far easier to play with. I would love to I really can’t remember much about Phantom. i review a racket and then have to return it. Some rackets stand out and others can be forgotten despite their quality. 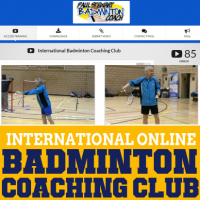 Hi Paul…..I am an ardent follower of your reviews.I am a lower end intermediate badminton player. 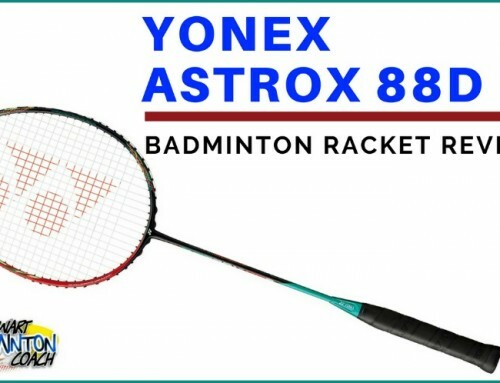 Would you Please compare this racket with thruster k6000. 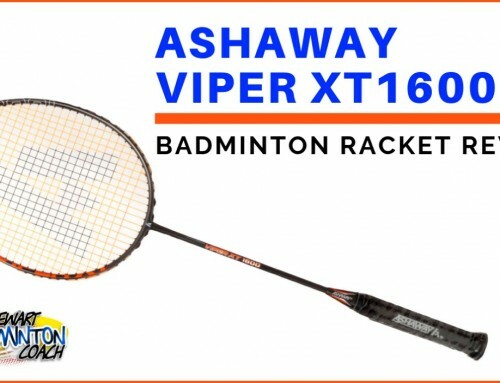 I am looking to add one more racket to my bag which should be nearer to tk6000 as it is out of stock everywhere in india. Purchased tk6000 after reading your review but could not play with it due to some back injury. Started playing after almost a year and half and found tk6000 as the best racket I ever played with. Always played with mid end voltrics(most of them are flexible). I found tk6000 head light or even balance which is bit strange. I am doing your armchair excercises which are helping me to cope up with its extra stiffness. Also please give some tips for mobility as lunge/forward bending is quite restricted and painful as well. 9900 is a compact head which means it is slightly smaller than 6000. It is also slightly stiffer flex. I have no idea why your lunge is painful or where the pain is. It is wrong to mobility exercises until you understand why you are in pain. Go and see a physio first and have some treatment to clear the pain. 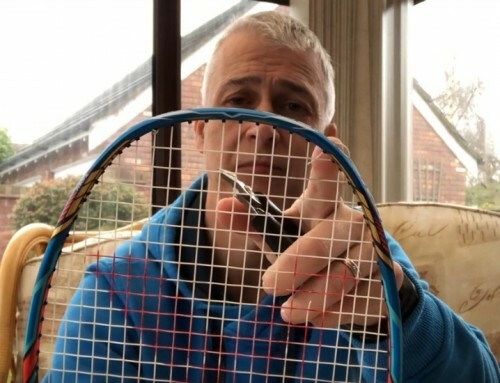 Hi Paul, how would you compare the swing of this racket with the js12? I have a 4U and am considering getting the 4U k9900. I understand that you tested the k9900 on 3U, but any input would be helpful. Thanks! I can only compare rackets I have. There are a number of retailers in the UK still selling the previous version. They are different although bear the same name. Of course they wish to sell old stock and I understand that. I can imagine the 4U version of the TK9900 will be quicker than the 3U. JS12 swings faster because it has less weight in the head. JS12 also has a standard size head so will have a different feel on impact. Hi Paul similar question re user friendliness between the LDF and 9900 – is one more user-friendly in comparison to the other… I’m a lower end intermediate player and am often pushed to the back of the court in MD… Currently working of getting my strength back up following years out of the game!! Neil – both are user friendly although you may prefer LDF on the basis that it has a standard size head. I like the compact heads but they do have a different feel. Hi Paul – really like the reviews they have helped me narrow down to two potentials to suit my playing style. I’m also considering both the LDF and this 9900 but am on the lower end of the intermediate scale and play at a club level. Would one/ either be suitable for someone who has a slightly weaker backhand? Neil – both play really nice. 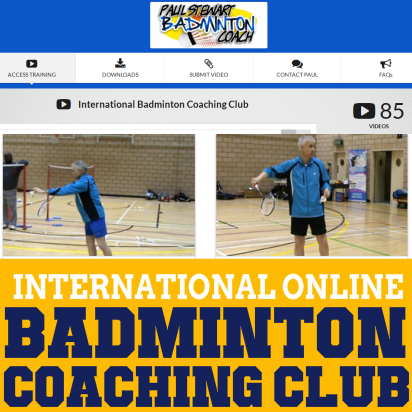 If you have a problem with your backhand then see a coach and get it sorted. An astonishing leap from the Mk1/2. And I thought the HX900 was going to be my weapon of choice for next season… glad I took the risk on these! yes, TK9900 has been very popular with all players I have run a demo session with. Being on the market for a VT80 replacement, I was quite drawn to the LDF, however I’ve very impressed with a recent issue I had with Yonex, therefore feel I ought to try another manufacturer. Given you have played with both LDF and this 9900, are you able to offer any comparison between the two? If it helps I mainly play doubles and I would class myself at the upper end of intermediate level. Both of these rackets will be sitable replacements for your VT80. The difference between the two is basically 9900 has a compact head. Aside from that they are close in spec but very different feel. I expect both are good for doubles if you already handle head heavy rackets.